A nurse checking a patient’s moles at a hospital dermatology department. While giving classes on skin cancer to nursing students, nurses, healthcare support workers and allied healthcare professionals, it has become apparent to me that many of them are not aware of the most common types of skin cancer. They are also unaware of how skin cancer can develop or what to look out for on the skin. There is limited knowledge on how to educate patients about the risk of developing skin cancer, and how to try to prevent it. Levels of knowledge and awareness among these individuals varies with regard to the risk factors, incidence and prevalence of skin cancer in different patient groups. Specialist skin cancer nurses and educators have an important role to play in educating nursing staff and allied healthcare professionals so we can reduce the gap in knowledge that currently exists in our healthcare workforce. Front-line healthcare staff, especially those working in the community, where there are many older patients, need an awareness of skin cancer and how it can be prevented. This will make them better-equipped to identify individuals who may be at a higher risk of developing skin cancer. People who have or had fair skin that burns easily in the sun, light-coloured eyes (blue, grey or hazel), naturally blonde or red hair, a lot of moles or freckles, a lot of sunburn in the past, regular use of sunlamps or sunbeds, and a previous history of skin cancer. People who work outdoors and/or those who have had a high level of exposure to the sun in the past. Immunocompromised or suppressed individuals, such as organ transplant recipients or those receiving long-term treatment for psoriasis. By having the relevant training and education, the healthcare workforce will be better at identifying changes in the skin that could be early signs of skin cancer. Some of the early signs include the development of new skin lumps, spots, ulcers, scaly patches or moles that were not there before and are not going away, or dark spots or marks on the skin including moles that have changed in shape, colour, texture or size. RELATED: Sunlight and cancer: what are the risks in the UK? 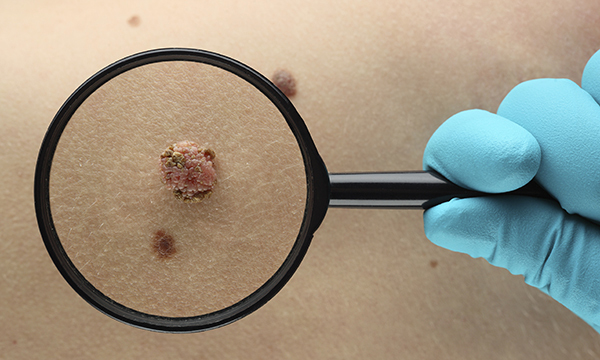 Nurses can look at the British Association of Dermatologists’ ABCD guide on checking moles and also refer patients to it to help ascertain signs that might indicate a melanoma. Signs to look for include sores and ulcers that do not heal, and areas on the skin that are painful or bleed. 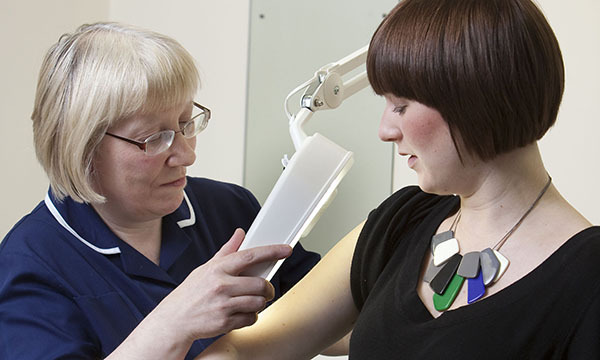 Specialist skin cancer nurses and educators can facilitate this process by delivering more teaching sessions – formal and informal – in the clinical environment and the academic setting. Educators can help by putting more emphasis on skin cancer and pre-cancerous skin conditions in the pre-registration nursing curriculum and by introducing study days to aid the continuing professional development of our nurses, nursing associates, associate practitioners, clinical support workers and allied healthcare professionals. With more people acquiring this knowledge, better health promotion messages will be delivered to our patients and healthcare professionals will be able to signpost, advise and educate others. This is in line with NHS England’s 2015 strategy for earlier cancer diagnosis and prevention. If we are able to identify skin cancers early the prognosis and outcome tends to be better, and by making people aware of how to protect their skin and reduce their level of risk we are preventing more skin cancers from developing.